Info "Take the enemy planes out of the sky! Press the button quickly for rapid-fire!" Airpain is a microgame in WarioWare, Inc.: Mega Microgame$! in the Anything Goes folder. Its name is a pun on an airplane. 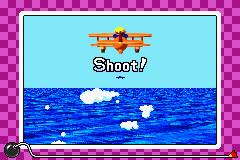 Wario is flying on his airplane, when other planes approached him in sky. The objective is to eliminate all the airplanes by shooting them before they crash into Wario. 1st level difficulty: The player must shoot one airplane. 2nd level difficulty: The player must shoot two airplanes. 3rd level difficulty: The player must shoot three airplanes. This page was last edited on August 7, 2018, at 09:57.